In September 2015, as the Queen neared yet another royal record – becoming Britain's longest-reigning monarch – the historian David Starkey paid tribute to the sovereign's careful, non-controversial approach to her role, dubbing her "Elizabeth the Silent." Indeed, silence has been a hallmark of Queen's six decades on the throne. In a world where everyone seems to have an opinion on every subject, the Queen has been resolutely tight-lipped about hers. She does not share her personal political views with the rest of us; the only hints we've gotten of her politics have come second-hand, through the whispers of party-goers, courtiers, and even the occasional indiscreet prime minister, never confirmed and never clarified. Andrew Marr wrote in 2012 that the Queen "has never 'confessed' or reinvented herself. When something hurtful or wrong is reported she bites her tongue. As a young woman she was a global superstar, but she does not play to the media in a gushing way and certainly does not court them." In a monarchical world where image is everything, Marr argues, the Queen simply "has no image" at all. This silence – this lack of defined image – allows for much interpretation. The Queen is a cipher: she can be everything or nothing at the same time. Since she doesn't express her own feelings, thoughts and opinions are often assigned to her. She becomes a sort of mirror, reflecting back any opinion that the holder wishes to project upon her. And that brings us to the matter at hand. This week, the press has gone wild over one of these projections, a theory that argues that the Queen hasn't actually been silent at all – but instead has been telegraphing us secret messages about her politics. Her preferred method of expression? Her jewelry – specifically, her enormous collection of brooches, the glittering ornaments that she pins to her coat or dress for nearly every public engagement. Unsurprisingly, this new theory about the politics of Elizabeth II's jewelry has come courtesy of two of the defining entities of 2018: Twitter and Donald Trump. I had really, really hoped to be able to avoid discussing the American president's recent visit to Britain on this site. In recent years, I have received numerous messages from readers who are grateful for this site as a place to escape from the overwhelming rhetoric of daily life. I won't argue that The Court Jeweller is completely apolitical. How could it be? Most of the jewelry discussed here is worn by people in power, and power is inherently political. Even so, I try very hard to make this a place where people can discuss jewelry (and its personal and historical implications) in a civil, friendly way, devoid of the kind of sniping and anger that seems to have infected so many of our conversation spaces. Accordingly, when it was first announced last year that the current American president would be making his way to the United Kingdom for an official visit with the Queen, I decided not to cover the visit on the site. This was a personal choice. I'm not exactly the Queen (ha! ), but I do try not to discuss my own political views here, mostly because that's not what this place is for. As I do not hold the same views as the president, I thought it would be best simply not to speak about him here at all, in any context. This website was not designed to be my personal soapbox. As this week has progressed, however, keeping silent about recent events has become increasingly impossible. 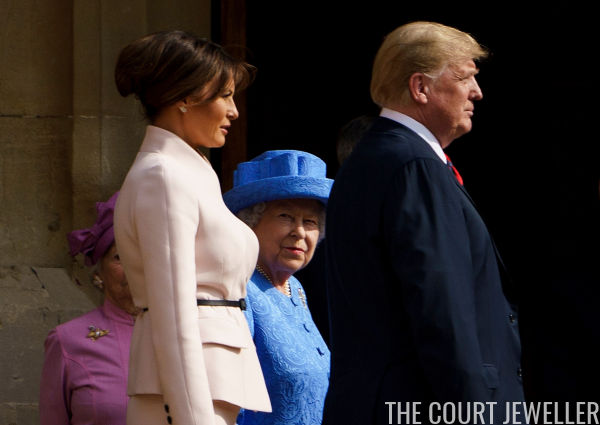 The Queen's jewelry has become the story of the presidential visit, and I've been contacted by readers, members of the press, and even family and friends asking for my opinion on the matter. The more I've thought about it, the more I've realized that not commenting means that I'm simply allowing others to infer my views, either correctly or incorrectly. In the end, presenting my own views on the issues here, in a central place, as succinctly as I can, seems like the best option. On Thursday, July 12, the President and the First Lady arrived in London, where they were greeted at the airport by the Lord-Lieutenant of Essex on behalf of the Queen. In the evening, the couple attended a black-tie dinner alongside Prime Minister Theresa May at Blenheim Palace. Meanwhile, at Windsor Castle, the Queen held a series of audiences with religious leaders, meeting with the Archbishop of York, the Bishop of Bristol, the Bishop of Carlisle, the Grand Imam of Al-Azhar, and the Archbishop of Canterbury. 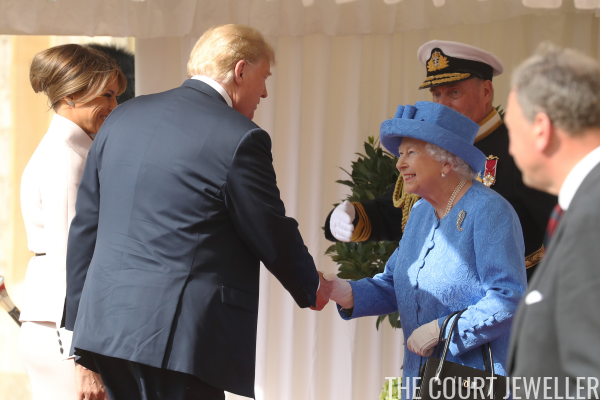 During those audiences, the Queen wore a brooch that she received in May 2011 during the last state visit from an American president: a small floral brooch, made in America in the 1950s, consisting of moss agate and diamonds set in gold. The Queen had previously worn the brooch for the "return dinner" during the May 2011 state visit, a black-tie dinner hosted by President and Mrs. Obama at Winfield House, the London home of the American ambassador. On Friday, July 13, the Queen welcomed the President and the First Lady to Windsor Castle, where they had tea. For this visit, the Queen wore a diamond and platinum brooch inherited from her late mother. The brooch, which Hugh Roberts calls "Queen Elizabeth's Palm-Leaf Brooch," was ordered by the Queen Mother from Cartier in 1938. The brooch, which is made to resemble the palm-shaped sarpech ornaments worn by Indian princes, is set with diamonds that came from the Queen Mother's collection. The Queen Mother wore the Palm-Leaf Brooch extensively during her lifetime, but she did not wear it, as has been extensively reported, for her husband's state funeral. (Instead, she wore the brooch a few days before, on February 11, 1952, at King's Cross Station as King George VI's body was transferred to London.) When the Queen Mother died in 2002, the Queen inherited the Palm-Leaf, and it has become one of her most-worn brooches. One of her recent appearances in the brooch came in March 2018, when she wore it for the decommissioning of HMS Ocean in Plymouth. On Saturday, July 14, the Queen welcomed the King and Queen of the Belgians to Windsor Castle, where they had tea. For this visit, the Queen wore a new brooch set with diamonds and sapphires. The brooch, intended to resemble a snowflake, was presented to her as a Sapphire Jubilee gift on July 19, 2017, by the then-Governor General of Canada, David Johnston. The brooch was made by the Saskatchewan jewelry firm Hillberg & Berk as a companion to the Queen Mother's Diamond Maple Leaf Brooch; the sapphires set in the jewel were discovered on Baffin Island in 2002. This was the first time that the Queen wore the brooch in public. On Saturday, I started getting social media notifications from users curious about the Queen's brooch choices during the week, especially the decision to wear the American brooch on Thursday. On Sunday, I got even more notifications and messages, as a Twitter thread about the Queen's brooch choices by a user named Julie (who uses the handle @SamuraiKnitter) went viral. Julie discussed the brooches that had been worn on Thursday, Friday, and Saturday, and concluded that the Queen was using her jewels to engage in what she termed "brooch warfare." Julie's theory boils down to this: she believes that the Queen chose her brooches on Thursday, Friday, and Saturday as a way to subtly insult Trump, essentially using a sort of code to let us know that she was having a laugh behind his back. On Thursday, she wore a brooch that was given to her by the President and Mrs. Obama, which Julie argues was chosen because it was given to the Queen "out of friendship with the Obamas as people." Friday's Palm-Leaf Brooch, Julie writes, was an jab because it was "the brooch her mother wore to her father's state funeral." (Not quite, as stated above, but essentially she classifies it as a brooch for wearing in mourning.) And finally, she interprets Saturday's snowflake brooch as a gesture of confidence from the Queen to Canada, a country that the president "has been screaming about and insulting." (She also notes that the Queen may have chosen it as a reference to the use of the word "snowflake" in various political arguments.) As a whole, her theory goes, the usually-silent Queen used her jewelry last week to tell the world that she prefers the current president's predecessor, she is in mourning because of his presidency, she is on Canada's side (which would make sense, as she is Queen of Canada, after all), and she thinks he's a "snowflake." One of Julie's tweets in particular sums it up: "Nice way to get in a dig … without having to say a word." The press, always eager for a fresh take on royal news and ever hungry for clicks, has jumped on the theory. Several have also written pieces that either support or disagree with Julie's conclusions. There are some who have targeted parts of her argument on a factual basis, but that's not really the issue I take with it personally. As I said above, the Queen's perpetual silence on matters of politics means that people look to any gesture from her to try to suss out her personal feelings on issues. This "brooch warfare" theory is basically another one of those moments. 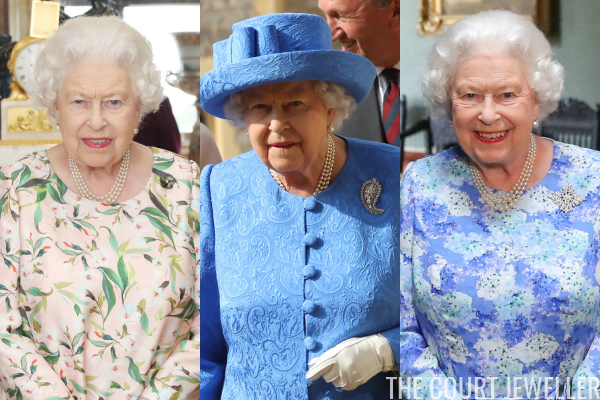 The fact that the Queen wore these three brooches isn't in question – it's the interpretation of what the brooches mean that is a matter of debate. 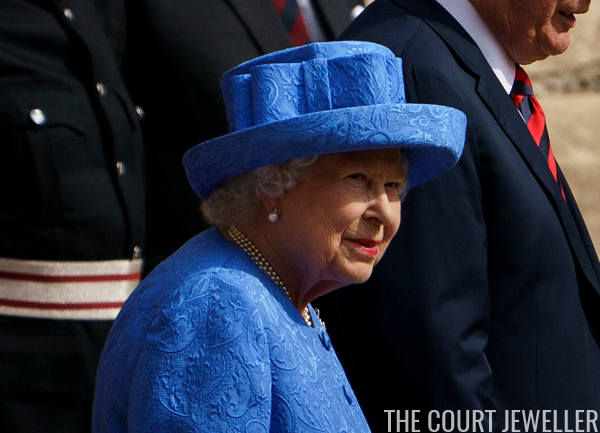 There's no question that the Queen's jewelry is often symbolic. Julie herself writes in her Twitter thread that the Queen "does hundreds and hundreds of appearances, and maybe 95% or higher, she wears a brooch. And the brooch is always significant." She's right, although the word always is a bit of an overstatement. The Queen's jewelry often does have a connection with the people and places she visits. When organizations give her a brooch, she often wears that brooch each time she visits them. Military badges are brought out for appropriate events. Foreign gifts often only see the light of day when representatives of that country encounter the Queen again. In my opinion, the problematic logical stretch that Julie's theory makes is found in its interpretation of the intent behind the jewel-wearing. The Queen often uses her brooches to make statements, but like everything else she does, those statements are diplomatic. Jewels are used as a gesture of acknowledgment, not insults; they're used to build and reinforce bridges, not burn them down. The Queen isn't in the business of causing controversy. Her entire six decade reign has been geared toward avoiding controversy as much as possible. She is the living embodiment of the state, and in that representative role, she remains studiously neutral. Perhaps Elizabeth Windsor did have a laugh about the president after he departed from Windsor Castle. Perhaps she finds his behavior and his views objectionable, even repugnant. (She wouldn't be alone.) But there's a difference between the Elizabeth Windsor who lives behind the closed doors of her royal apartments and the Queen Elizabeth II who appears in public as the monarch, the symbol of centuries of power and prestige. The Queen knows better than to let her private self, political views included, mix with her public persona. She's done this for six decades, and I don't see a reason to believe that she'd so radically change her strategy now. This American president isn't the first controversial head of state that the Queen has met. 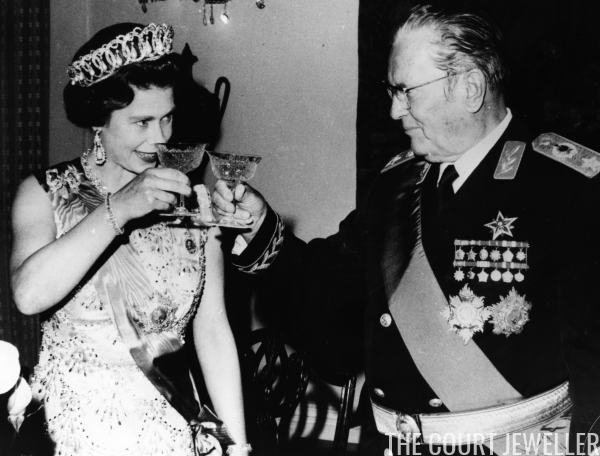 She hosted Tito for a luncheon at Buckingham Palace shortly before her coronation and later visited him in Yugoslavia. She presented Mugabe with a knighthood in 1994 (an honor that was later rescinded). In 2002, she met with Assad at Buckingham Palace. She welcomed Ceausescu for a state visit in 1978. Historians have written about her personal, private unease with some of these encounters, but each visit was undertaken with the same practiced, diplomatic cool that she has perfected during her reign. Lord knows, it's tempting to want to believe that a remarkable woman like the Queen is just like us – that she holds the same views that we do, and laughs at the same jokes, and believes in the same truths. That, privately, she enjoys the "trolling" and the "owning" and the "shade" that so many on social media relish today. Part of her success lies in the fact that her studied neutrality allows all of us to believe that she might be with us, no matter what we believe. But the Queen is never, ever going to tell us in certain terms what she thinks about the political world she has inhabited for more than half a century. So, what we have in the end is a trio of brooches. The first: an American brooch, one of few in her collection with ties to the States, worn on the eve of her meeting with an American president. The second: a glittering, personal brooch worthy of a meeting with a fellow head of state, but worn so often that it defies easy categorization of meaning. And the third: a gift from one of her Commonwealth realms, worn almost a year to the day after it was presented to her. You can develop, as Julie has done, an interpretation of the jewels that sees them as a collective attempt to jab at a political adversary. But it's equally possible to view the brooches as separate and unrelated pieces, none of which were intended to insult anyone. Given the Queen's long example of careful diplomatic behavior, the latter interpretation makes much more sense to me. I've read comments from many who have taken great delight in the thought of the Queen lobbing veiled insults at Trump, a subtler version of the way that he so casually and cruelly lobs them at others. Some have argued that, even if the idea of the Queen's "brooch warfare" doesn't totally hold water, it's simply an entertaining story, a bit of harmless fun. Well, maybe – but only if you see the complicated, delicate, and often fraught world of international diplomacy as a lighthearted game. Based on her behavior over more than six decades as head of state of one of the world's powers, I'd argue that it's much more likely that Elizabeth the Silent simply doesn't see it that way at all.